Home Politics Atiku Abubakar, Other PDP Leaders Meet With “National Peace Committee”. Atiku Abubakar, Other PDP Leaders Meet With “National Peace Committee”. 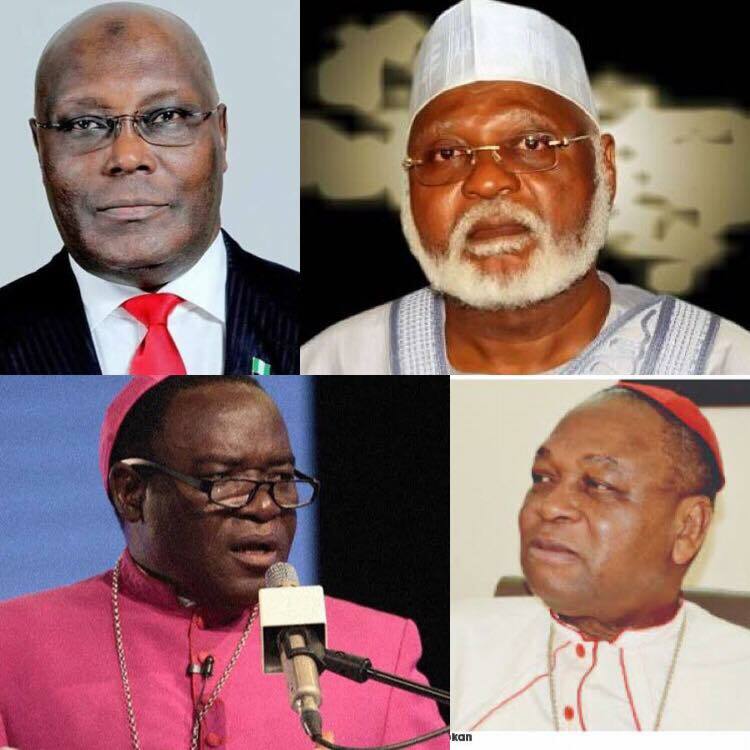 Atiku, Abdulsalami, Kukah and Onaikan. The Presidential candidate of the Peoples Democratic Party and former Vice President of Nigeria Atiku Abubakar on Thursday, 28 February met with the National Peace Committee. The National Peace Committee was represented at the meeting which took place in his residence in Abuja by former military Head of State, Gen. Abdulasalami Abubakar (Chairman), John Cardinal Onaiyekan and Bishop Matthew Hassan Kukah. The PDP presidential candidate was represented by himself, his Vice Presidential candidate, Peter Obi, Senate President and DG of PDP Presidential Campaign Council, Sen. Bukola Saraki, Speaker of the House of Representatives, Yakubu Dogara and National Chairman of PDP Prince Uche Secondus. Atiku and his team reaffirmed that the presidential election of 23 February was the worst in the history of the country since the return to democracy in 1999. Ahead of the 9 March governorship and state house of assembly election, the Atiku Abubakar team called for the unconditional release of all those illegally arrested and detained for political reasons. They also called for the non deployment of the military in compliance with constitutional provisions and the subsisting judgement of the court. The issue of Atiku Abubakar and his party’s recourse to legitimate actions to reclaim his stolen mandate was not discussed at the meeting, but restates that as a democrat, he will follow laid down constitutional and democratic procedures to challenge the electoral malfeasance committed by APC in cohort with INEC.